S: BISS CH Lajosmegyi Patent Pending R.O.M. SS: BISS BIS CH Lajosmegyi Dahu Digal R.O.M. D: CH Ibis Blizzard R.O.M. We were lucky enough to make Ch. Ibis Copyright By Irie (“Bonnie”) a part of our lives in the fall of 1999 after her show career was completed and she was ready for the easy life. Many thanks to Wynne Smith of Irie Komondorok for letting us have this wonderful girl! 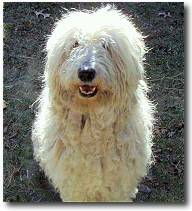 Bonnie was an extremely affectionate Komondor, although she still was a serious guard when she felt she needs to be and took fine care of us. 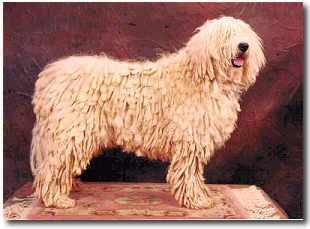 Bonnie was an excellent example of the breed and was a great breed ambassador wherever she went. She knew she was very special – and we did too. Because of her we were introduced to the wonderful world of Komondorok. She will be forever in our hearts.